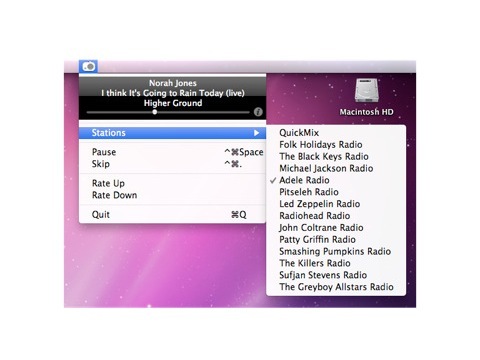 Pyrcast is a Mac app developed by Alex Winston that lets you listen to Pandora stations with a simple and compact menu bar interface. If you’re a fan of Pandora and want a way to listen your already created stations without all the hassle, Pyrcast is a great solution. The app has very few actions you can perform as of right now. You see a list of your Pandora stations that you’ve created under the Stations menu including the QuickMix which is the default. You can’t create new stations or search for anything. Playing and pausing can be done from the menu bar drop-down menu in Pyrcast and is tied to the keyboard shortcut ^⌘Space. Now if you have CoverSutra installed as well, you’ll notice that app also uses the exact same keyboard shortcut to Pause/Play a song. So you’re asking which one runs if you hit those keys? Both do! That gets a little weird at first but there are ways around it. Pyrcast does not have a way to edit its keyboard shortcuts, but thankfully CoverSutra does. So you can get around it that way. Another creative possible fix I found leads to you always playing either your iTunes music via CoverSutra or Pandora music via Pyrcast. To do this, start play using your mouse in either of the two apps. Now when ever you hit ^⌘Space, one app pauses and the other starts playing. The other two options in Pyrcast are the ability to rate up/down any actively playing song in Pandora. When you rate a song down it skips to the next. There are no keyboard shortcuts for rating stuff. There is a now playing info panel in the drop down menu that displays the song name, artist name, and album name, along with a simple seek slider that just shows you visually how far along a song is. It would be nice if available cover art was also shown, along with a minute:second timer. Clicking on the song info panel from the drop down menu takes you to the iTunes webpage where you can buy the tracks. If you appreciate simple, clean and minimal design (and functionality), and are looking for an app to listen to Pandora on your Mac that hides away in the menu bar, Pyrcast is a perfect choice. If you want lots of features and bells and whistles however you will find yourself wanting more. I would really like to see at least some basic preferences added. For example the ability to manage and edit the keyboard shortcuts would be great. Add the ability to manage stations and Pyrcast would be easily a 4 star app. Update: Pyrcast has received a DMCA takedown from Pandora and the Pyrcast app has bee pulled from the Mac App Store. AppSafari review of Pyrcast was written by Joe Seifi on February 5th, 2011 and categorized under Mac Apps, Music. Page viewed 3492 times, 1 so far today. Need help on using these apps? Please read the Help Page.